By July 1912 suffrage organizing was in full swing across the state; suffragists continued to travel, organize, and work in local communities at fairs, parades, and in other celebrations. Newspaper accounts from around the state provide evidence that the suffrage question was flowing through the popular culture of Oregon. Here are two examples—a suffrage song in Philomath and a lumber company advertisement from Lakeview. The Oregon Journal reported, on July 7, 1912, that Philomath resident Winnie Hull Springer, “an ardent suffragist” had written a song titled “Ballots for Women.” Springer reported that she was glad that the pioneer women in her family were “brave” and not the “‘Fluffy Ruffles’ type that thinks it womanly to faint at the sight of a mouse and to disclaim the possession of a brain.” Her grandmother and mother both supported votes for women. The 1910 Census listed Springer as a thirty-year-old public school teacher. “‘Ballots for Women Song’ is Produced,” Oregon Journal, July 7, 1912, 7. And here our home remains. Be for us as well as you? Hurrah for its manhood true! Make us its citizens true! For me as well as you. Our native state, so blest. 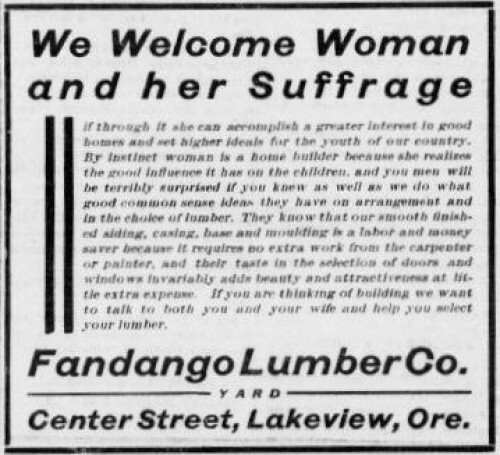 Fandango Lumber Company Advertisement, Lakeview County Examiner, July 25, 1912, 2. If through it she can accomplish a greater interest in good homes and set higher ideals for the youth of our country. By instinct woman is a home builder because she realizes the good influence it has on the children, and you men will be terribly surprised if you knew as well as we do what good common sense ideas they have on arrangement and in the choice of lumber. They know that our smooth finished siding, caning, base and moulding is a labor and money saver because it requires no extra work from the carpenter or painter, and their taste in the selection of doors and windows invariably adds beauty and attractiveness at little extra expense. If you are thinking of building we want to talk to both you and your wife and help you select your lumber. The votes for women message was moving across Oregon in July 1912 and was becoming part of the fabric of popular culture in the state. And some business owners were banking on its popularity with customers, suggesting another level of growth in the movement.